So, the Bush administration was caught with its pants down, spying on thousands of Americans without a warrant, with the complicity of telecom corporations. So to try to get this massive violation of the Fourth Amendment of the US Constitution out of cowboy territory and under some sort of rule of law, Congress in 2008 enacted the FISA Amendments Act, which supposedly puts such surveillance under the supervision of judges who have security clearances. Nevertheless, Americans can be wiretapped and spied on for as much as a week without a warrant. I can’t find anything in the Bill of Rights about a warrant only being necessary if the unprovoked government monitoring goes on for more than a week. 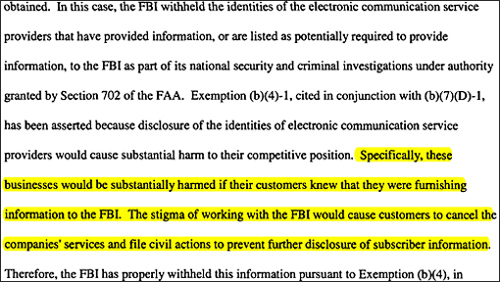 The American Civil Liberties Union remained suspicious that the Federal Bureau of Investigation was doing things not provided for under the law (a law they hold is itself unconstitutional). So they sent in a Freedom of Information request and got back piles of paper with black lines through a lot of the text. The piles of paper did reveal that the ACLU’s suspicions were correct, and that the law wasn’t being followed in many instances. But it also revealed that some US telecom companies still seem to be spilling our information to the government on request, without a warrant. So the ACLU wrote in asking that the black lines be removed and the identity of the telecom companies involved be revealed. Amazingly, the FBI answered the question straightforwardly. The official who wrote the reply thinks that the FBI works for the corporations, and not for the people or the Constitution.